If you’re looking for something fun to do in Santa Barbara you’re in the right place. From high-end rentals to some of the best instruction and tours available we’re here to make your experience in Santa Barbara as fun and amazing as it can be! We’ll typically pick you up and bring you to the best location for your activity in town or meet you at that location depending on availability. That being said we can often do road bike tours right from your hotel/house or do stand up paddle lessons, kayak tours, and rentals for all beach related activities on the beach across from any of the beach front properties in Santa Barbara, Montecito, and Goleta. We’d love to show you the Santa Barbara many don’t see! I was a collegiate baseball player and a biology student at Westmont College in Santa Barbara. This place is one of the most beautiful locations I’ve ever been to let alone lived in. I decided a few years back I’d love to be involved in helping others see some of the true beauties Santa Barbara has to offer. From those visiting to the many locals that have lived here for years and never ventured out on the ocean or hiked one of the trails overlooking the city, SB Channel, and Channel Islands. I hold a personal training certification from NASM and will do just about anything from mountain biking to stand up paddling to kite boarding. Myself and anyone at Cal Coast Adventures would love to take you on any one of the activities we offer. 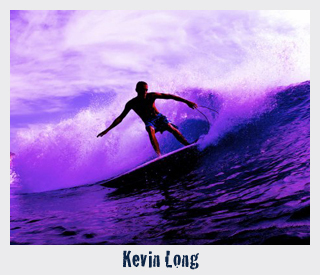 Born and raised in Santa Cruz California, Kevin developed a deep connection with the ocean from a young age. “Surfing has been one of my biggest passions since my dad pushed me into my first wave when I was only five, and since then I have traveled to some world class surf destinations, and have competed in several surf contests, and paddle board races. In 2003 Kevin took first place in Santa Cruz’s high school surf league. “I grew up playing just about every sport known to man. I realized the knowledge I had gained through my own pursuits could be used to help others live happier and healthier lives”. He has been working as a fitness professional for over 7 years, holds an Associates Degree in Exercise Science, and is a Certified Health and Fitness Specialist through the American College of Sports Medicine (ACSM). 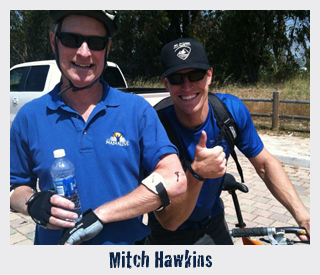 “I am so stoked to have joined forces with Cal Coast Adventures! Why spend all of your time inside a gym when you could go outside and experience the beauty that Santa Barbara has to offer? Whether its personal training on the beach, going surfing, hiking through the foothills, or touring the coastline on a kayak or paddleboard, I can show you how exercise can feel less like work and more like play. That’s why I operate by the motto Train Hard, Play Hard!”Other Certifications: CPR AED TRX Suspension Training Core Fitness Roller Level 1 Trainer Parisi Speed School Performance Coach. As a young surfer growing up on the central coast, I hadn’t really grasped how incredibly lucky I was to be experiencing the coastline of California as my own back yard. It wasn’t until I moved to Europe out of high school to travel that I began to truly realize where my home was. To me, surfing California wasn’t just a place of exercise or an opportunity for sports. Although it was a place for those things as well, it was the place I felt most connected with nature. I remember so many times running into the house to tell my parents about the waves I had caught that day, and about the way it felt, only to have words fail me and a lot of sound effects come out instead. the ocean isn’t something you can experience through someone else. The only way is to suit up and board up. Surfing makes me a better person, and I know now that the water is where I belong. My goal is to share my passion for the ocean as not only an instructor, but as a friend giving back to the sports that made me who I am today. I know with the skills I’ve learned, and the situations I’ve experienced, I can help provide the tools necessary to get you started on your own path of exercise, adventure and indescribable beauty. Wether its furthering your technic in paddle boarding, kayaking or surfing, or simply your first time in the water, I’m confident that either myself, or anyone else in the Cal Coast Adventures team can make your experience an unforgettable one! Born and raised in the foothills below Tahoe I developed a passion for the outdoors at a very young age. I started skiing around four and begin my life long love affair with motorcycles at age 7. I raced desert all through high school. It wasn’t until I moved to Spokane for college that I got hooked on cycling in the absence of motorcycles. Starting with an old road bike I joined the cycling club and raced road and cyclocross across the northwest. I’ve been really fortunate to have riden in lots of amazing places with all different breeds of cycling enthusiasts, from a Carnivale themed fixed-gear Allycat in Modento to a Super D in Eastern British Columbia. I’ve found that love of bikes is a universal language. Santa Barbara called to me after a string of lousy snow years in Tahoe left me ready for a change. All it took for me was one ride to the top of Romero to decide that this place was going to be my new home. The mountain and trails here are truly on another level! The proximity to the ocean, pitch, scenery, and vertical feet make for terrain that anyone could appreciate from the true beginner to a pro from Whistler. My job as your guide is to figure out which trail you’re going to have the most fun on depending on your experience and ability. I’ve taken families out with young kids on some beautiful coastal trails, and downhill racers down mountain trails that push their limits. Taking a mountain bike tour with Cal Coast Adventures is not a cookie cutter tourist experience on tired equiopment. We’ve got great bikes and unreal trails; if you’re into bikes then book a tour and let’s ride! 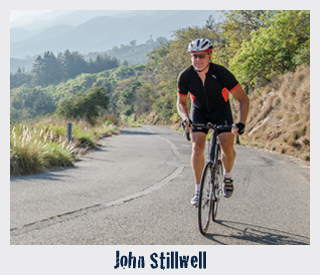 I am an avid cyclist, who feels lucky to live and ride here in beautiful Santa Barbara. 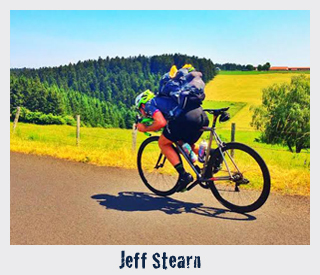 There are not many roads or trails I haven’t ridden locally, so if it’s a challenging climb or single-track trail, or a peaceful scenic tour you’re looking for, I look forward to sharing my experience with you. I love sharing my local knowledge with my riders; bike set up, gearing suggestions and safety are my main concerns. My goal is to have fun every time I get on my bike, and I am both enthusiastic and determined to show all of my riders the best time possible. I am keen to adjust the route to address any special requests you may have. My lifetime passion for cycling runs deep, having raced road, mountain bike, competed in triathlons, ridden 24-hour events, century rides, and wilderness bike camping trips. Santa Barbara is a unique cycling destination, be it the weather, the roads, the trails, the scenery, the views, or all the above! I look forward to showing you the best Santa Barbara has to offer. Born and raised in Mill Vallley, I found myself in San Luis Obispo for school and eventually Santa Barbara upon graduation. I made the conscious decision to pursue my passion for everything outside four walls. This decision has given me time to focus on the important things in life; cycling all over the world, currently mountain biking in Santa Barbara and taking my dog to the beach at 10am on Tuesdays. For the past few years I have immersed myself with the science and theory behind the hydration and nutrition of the worlds top athletes; cooking and sharing real food with authentic people at every free opportunity with the Boulder, CO based Skratch Labs. When I’m not exploring Santa Barbara on my mountain bike, I keep busy working with several companies that share my values and don’t ask me to sit at a desk. 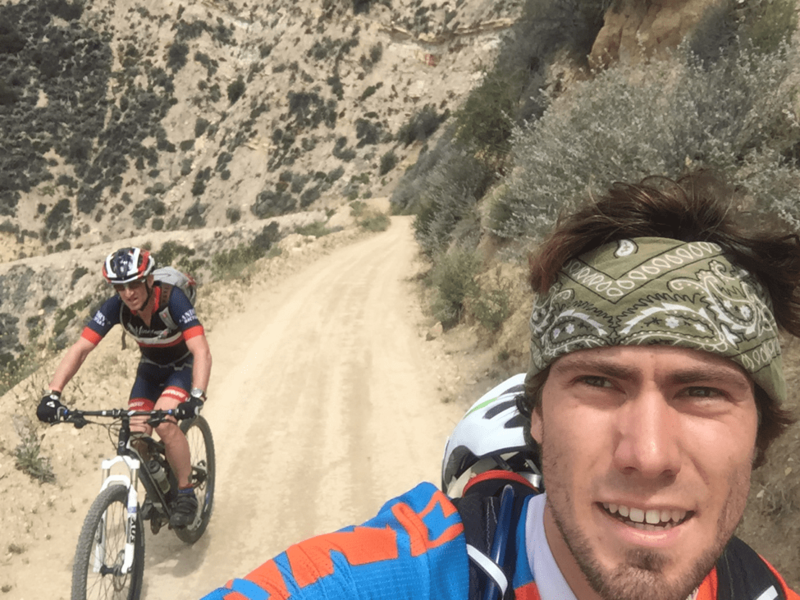 I look forward to sharing an unforgettable experience with you on the trails and roads of Santa Barbara! 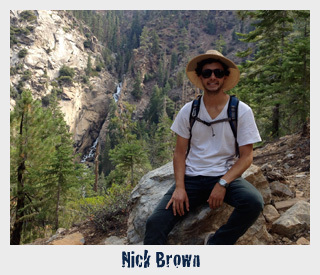 A fifth generation Santa Barbara native, Nick grew up in the local hills and mountains, spending as much time exploring in the rock formations as he does paddling in the ocean. Graduating from the University of Colorado at Boulder in 2012, I focused in Geology, Film Studies, and Sociology. For the past Five years, I have led groups of up to 80 persons into the local as well as Sequoia National wilderness for hiking, backpacking and fishing trips, specializing in the local flora and fauna. My passion for the outdoors is one of my favorite things to share with visitors as well as locals of this beautiful part of the world, and I think too often we forget to look up from the trail and appreciate what’s around us. Every day in Santa Barbara offers a new perspective on what’s in bloom, or what fish is swimming through the channel and I hope to go check it out with you! My name is Kaitlyn and I’ve surfed Santa Barbara my entire life. I was born and raised right here in Santa Barbara County, where the beach has always been my front yard. Surfing has been incredibly important to me growing up as well as needed in my life. It’s an escape from a busy life, something that gets you out of bed every morning, and puts a permanent smile and glow on your face that lasts a lifetime. While being a surfer, it has taught me to love and appreciate the ocean on a very deep and meaningful level. The ocean is the most beautiful and amazing thing on this planet, as well as the waves that it creates. Every time that I catch a wave, it is the most amazing feeling in the world. Surfing is an insatiable sport. After every wave or every session, you are constantly thinking how you want more and more! My passion and love for this sport is unexplainable, and the only way to experience this feeling is to get out in the ocean and do it yourself. I promise that after catching your first wave, it will be one of the most amazing and blissful moments of your life. My mission as a surf instructor is to make everyone that I teach feel comfortable in the ocean and give them a strong foundation to become an awesome surfer. 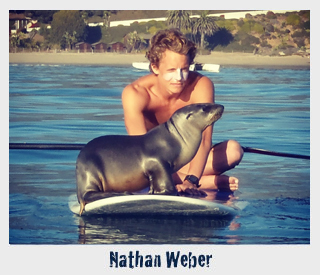 I am confident in telling you that if you choose to do a surf lesson in Santa Barbara with us, it will be a memory, feeling, and experience that lasts a lifetime! I am a recent graduate from the University of California, Santa Barbara. I grew up in northern California in the Napa Valley and found my love for adventure/action sports through skateboarding and snowboarding. I still enjoy them both, but when I moved to Santa Barbara I found surfing and haven’t really looked back since! 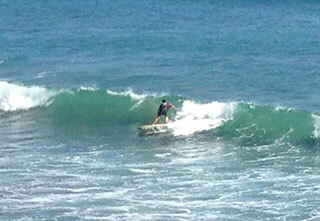 Now, I work as a surf instructor for Cal Coast Adventures / Santa Barbara Surf School. and through teaching lessons I have seen many others experience the same joy and sense of fulfillment that I have felt in my surfing, and I highly recommend anyone who is curious to come and feel it for themselves! "Hidden Jewel in Santa Barbara" -- My girlfriend and I stayed at Pacific Crest Hotel this weekend and had a fantastic weekend. Hotel is centrally located to all fun activities in SB. Owners are very friendly and very nice. Can't wait to stay there again.